Saturn, the karmic planet currently in retrograde, will be turning direct in the sign Sagittarius on September 7, 2018 (IST) and will be in direct motion until April 29, 2019 (IST). Saturn Direct in Sagittarius can bring significant transformation in all aspects of life. During this period, Saturn can make you more organized, goal-oriented and focused on materializing your desires. You should focus on bringing in material resources through perseverance and hard work. So, make use of these 235 days of Saturn Direct in Sagittarius to harvest the benefits of your hard work. Saturn turning direct in the 9th house of Karma and Dharma in the natural zodiac can help you remove your bad karmic baggage and bring positivity into your life. When Saturn is Direct, it is believed that no extra efforts are required to pay back your karmic debts. With this upsurge of positivity, you can more easily manifest success in career, finance, overseas and long-distance travel. During this period, taking up responsibilities and accomplishing goals can happen without extra efforts. Learn the lessons taught by the Karmic lord Saturn so that you do not revisit your difficult times. If you do so, Saturn in auspicious Jupiter’s house, Sagittarius, can help you manifest positive thoughts to experience a new reality in life. On the day when Saturn turns Direct in Sagittarius [Sep. 7, 2018 (IST)], the Moon will be in the star Pushya and will be sharing the sign Cancer along with Rahu. The Moon transiting in the wealth star Pushya fills the day with the energy to fulfill your desire and goals during the entire transit period. 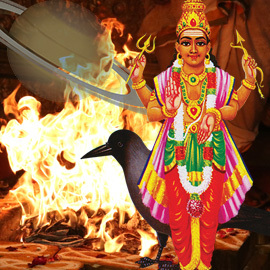 Performing remedial Poojas/Fire Prayer at the start of the transit can help you connect with a new, positive reality and receive ongoing blessings of Saturn. As Saturn turning direct favors setting strong intentions and redefining goals, it is the right time to enroll in our Ultimate Saturn Remedy Program to clear Karmic obstacles blocking your progress in life. AstroVed has selected ongoing and intensive remedies to reduce the adverse effects while increasing the positive blessings of Saturn. There is also an option for you to join our Weekly Saturn Remedy Program, where remedies will be performed for a week. One of the most important transits in 2017 is the transit of Saturn into Sagittarius. 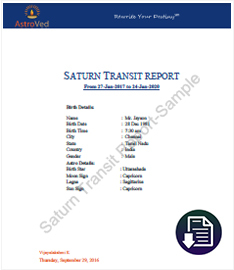 As each person’s birth details are unique, a personalized Saturn Transit Report will help you understand Saturn’s effect on your life. You will be provided with specific details of what to expect and suggested ways to lessen the impact and make the best of the favorable energies. Book your individual Saturn Homa to be performed on the day when Saturn turns direct in Sagittarius. Performing Saturn homa on the day of transit can help reduce the adverse impact of Saturn in the birth chart due to Sade sati (7 and half period of Saturn), 8th house Saturn, 4th house Saturn and Saturn Dosha (Saturn Affliction). You will receive the sacred grey ash powder from the homa and Vibhuti (grey ash powder), which will be blessed in the rituals. Keep this on your meditation altar and wear it on your forehead during meditation or at other times to expand the Divine blessings into your life.